n/a English. Black. Saint is short for Saint Bernard. Galgo is a type of dog similar to a greyhound. 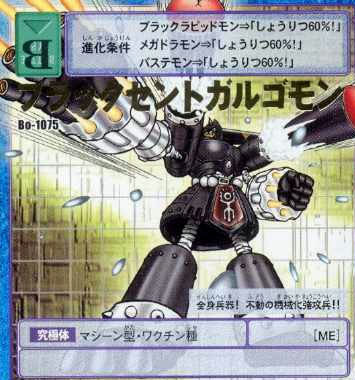 Giga Dramon + Win Ratio 60% A moving fortress that blows black smoke! A landing assault model Saint Galgomon!! He is not affected by a C attack's "A goes to 0"
Black Rapidmon + Win Ratio 60%! Megadramon + Win Ratio 60%!